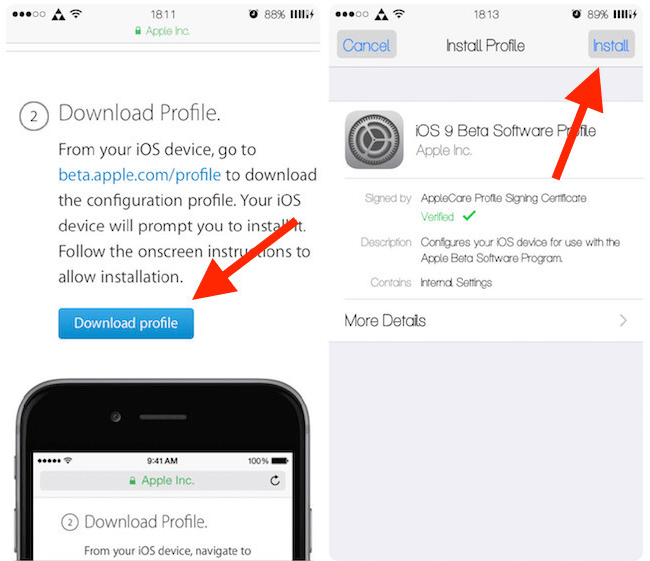 This post talks about the installation and download guide for iOS 9 public beta on your iPod Touch, iPhone and iPad. The installation is not complex, and we’re guide to write a detailed step by step guide to guide you through the process. Although this new beta is supported on a range of iDevices, it is a good idea to check if the compatibility is covered at all ends. Before you start, you can see if your device is supported by checking out the beta compatibility. iPad Air 2, Air, 2, 3rd gen, 4th gen, mini 3, mini 2, mini. A word: This iOS 9 version is a beta release, so don’t be surprised if you experience a bit of instability, battery life drainage, and performance issues, as these are a common occurring in beta releases. Also, you can use a secondary device to try out this beta just to be on the safe side. Step 1: First of all, make sure your device is on the latest iOS public version, by which we mean iOS 8.4. This can be downloaded from here. Step 2: Then, you need to register for the Apple Beta Software Program. 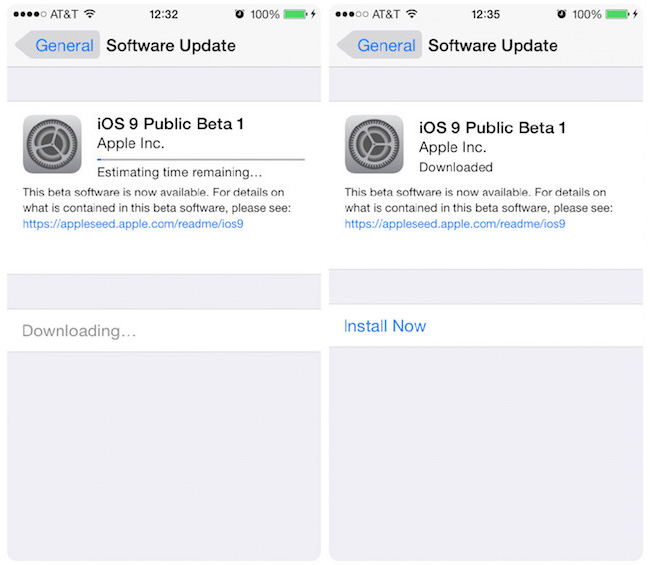 You can sign up for iOS 9 Public Beta Program by following instructions. Step 3: Point the browser to beta.apple.com and click ‘Sign In’ as displayed in the screenshot. For users who are starting fresh, they need to click on ‘Sign Up’. Step 4: Enter Apple ID and password to sign up. Step 5: Agree to the ‘Agreement’ by choosing the ‘Accept’ button on the bottom right of the screen. Step 6: The next step is to enroll your iOS device into the beta program. Step 7: Open the link in your iPad or iPhone: beta.apple.com/profile. Step 8: Sign in with the Apple ID account on your iDevice. Step 9: Now tap the button that says ‘Download profile’. Note: If the Apple Watch is paired to the iPhone then the following popup will appear. You should select ‘iPhone’ only. Step 10: Tap the button that says ‘Install’ at the top right. Then it will ask you to input the ‘passcode’ to confirm the action if there’s one in place. Step 11: Once the passcode has been entered, Apple will ask you to agree to a consent. Choose ‘Install’ at the top right. Step 12: Then again you’ll be presented with a popup that asks you to restart your device. Tap ‘Restart’ to do so. And that’s all you needed to do. If you run into any problems or just want to ask any question, feel free to leave comments.